I just experienced parenting alone for 6 ½ months. It was not my first time being the solo parent at home with my husband away, but it was the first with 4 kids. 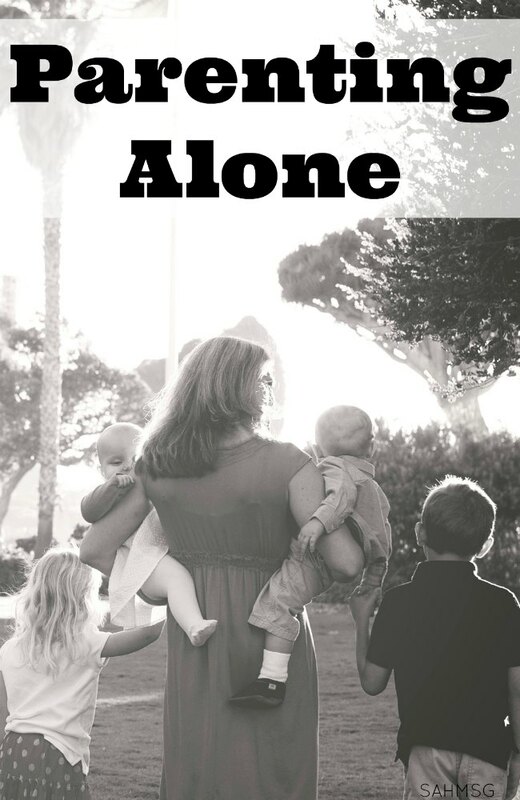 Parenting alone is a great way to get burned out and frustrated with being a stay-at-home mom…if you ignore these tips for making parenting alone a smoother experience for you and the kids. My husband is in the military so he travels frequently for work. Even as a kid, I witnessed my mom parenting alone a lot since my dad was a business man. When you are solo parenting there will be sacrifices-for you and the kids. You can do it. I have done it for days, weeks, months and even a year at one time. My husband’s job in the military has a lot of perks, and many downsides just like any job out there. What his job does provide is the opportunity, no the blessing, to be a stay-at-home mom to my children. So parenting alone is something that I see as a skill I need to learn. 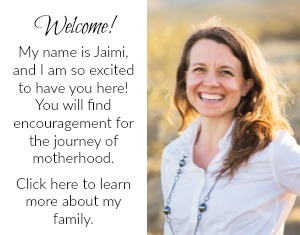 I recently asked the moms in our Stay-at-Home Moms Share Together group to share their tips for parenting alone. Many are wives to truck drivers, students, military guys and medical professionals. Every one of these jobs require many hours, erratic schedules and often travel. We can whine about it (which sometimes helps) or we can take action, grow our skills of parenting alone, and face the days when we are on our own to show our children what Wonder Woman really looks like. Make a list of everything you accomplish while parenting alone. I started a list in my journal when my husband was on a year-long deployment of all the challenges I overcame on my own from small things like killing black widow spiders (yes, more than one) and bigger things like 2 major surgeries with hospital stays and recovery time while caring for a one year old. I could look at this list on the bad days to remind myself of all that I was doing while parenting alone. Make the time away fun for your child with these 7 tips for helping kids cope when a parent has to travel from Mama Smiles. These Mom Motivation cards helped me when my husband was deployed. I printed them out, cut them apart and taped them around the house-bathroom mirror, kitchen cupboard door, front door-so I would see them in my busy moments throughout the day and remember to stay positive and grateful. Remembering the great things about my husband that I love, the things that I tend to forget when the laundry piles up or there are dirty socks left on the floor help me stay positive. Mark each week or even one night of a week-long trip with a special dessert. Ice cream sundae Sunday is one many of my military spouse friends do with their kids, or you could make this fun cake recipe for when dad has to be away that Mama Smiles shared. Make a countdown chain to count down the days until your spouse comes home. Paper plates are so helpful. That sink full of dishes at the end of the day is much less when you can just clear the table and toss it. I know many of us do not want to spend the money or waste that much, but if you get into a rough patch, paper plates are a great way to take a load off for a short time. Get coffee. Whether you buy a Keurig, use instant coffee to get an energy boost, or set aside the funds to drive through Starbucks once a week (or more) to boost your energy when you need it. When I start to let the solo parenting drag me down, I catch myself and remember that I can encourage my husband just as much as I want him to encourage me. I kept this mindset more during this deployment than I had in the past, but it made a difference. When I felt that I had encouraged him, it ultimately made me feel better too…and he would encourage me too. Exercise. Fitting in exercise when you are a busy mom is challenging, but when your spouse is not coming home at dinner time, it really does help to fill that time with productive activity. Online workout videos are helpful for this. The kids can join you to get them moving too. Choose to thrive when you are parenting solo like Amanda from Dirt & Boogers shares. You can grow from the experience and actually enjoy the close connection you will build to your children. The kids and I sent my husband pictures and artwork while he was deployed which helped the kids feel like they were motivating daddy. He even kept it all and brought it home with him, so I plan on creating a little scrapbook to remember the time. 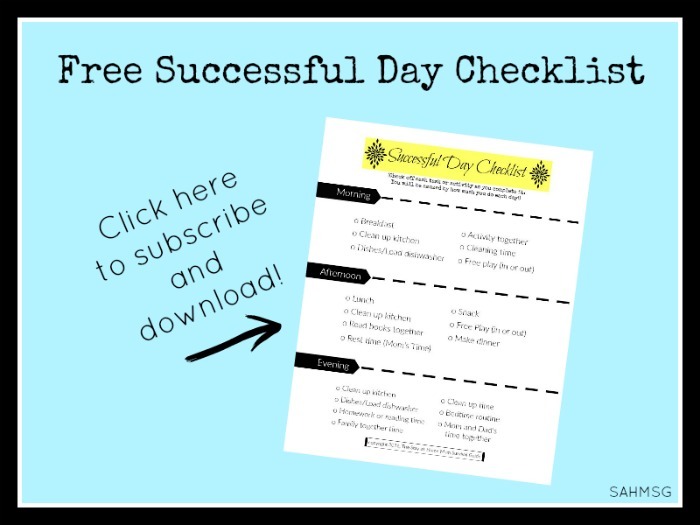 Find a daily routine for kids that works with your lifestyle. We have a quiet time after lunch when the kids watch cartoons or movies, play quietly and I do whatever I want in the house: I work on the blog, call my essential oils team to plan, sit with the kids and watch too, or fold the mountain of laundry. It gives me a window where if I do need some time for myself, I can try to fit it in every day. Sometimes me time does not work out, and some days I can fit in me time for myself…it changes by the day. I started diffusing Stress Away in the evening when the kids tend to get grumpy-and I tend to get less patient. 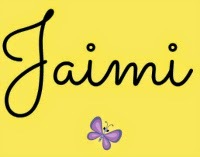 It helped me remember to take deep breaths and encouraged a calm mood to help me stay patient until bed time. Essential oils have supported me so I can stay balanced. Eat outside. Make it a picnic, or just serve dinner on an outdoor table to keep the crumbs and mess outside so you have less to clean up inside. Play with kids in a purposeful way. Parenting with purpose is a mindset that can be frustrating when you are the only parent at home. In my experiences, the more present I am during the day, the better behaved my children were all day long. They have a love tank that we have to fill, even when our energy tank is getting low. Playing outside with my kids in the evenings helped me achieve this goal. Fit in time to take care of yourself. I made a plan to spend the time after the kids were in bed watching movies with a glass of wine, reading, working on the blog, or reading devotionals. It was my time, and I think it made all the difference for not getting burnt out as a stay-at-home mom parenting alone. Join our Facebook group Stay-at-Home Moms Share Together to connect with other stay-at-home moms for support. Does your spouse travel for work? 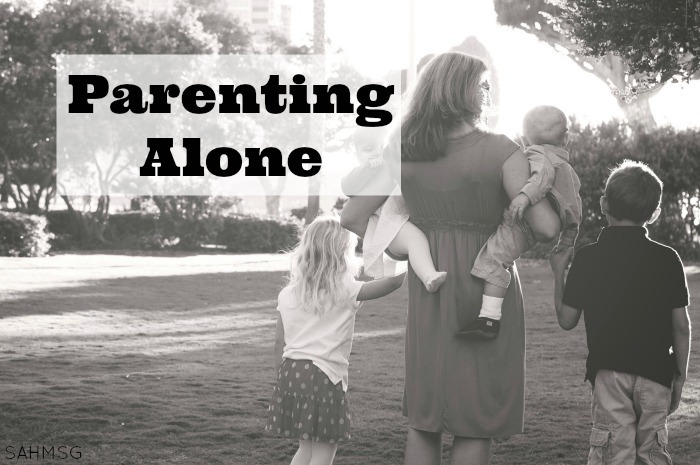 What are your tips for parenting alone?